Godrej Meridien: Welcome to a world where elements of luxury and comfort are just the beginning! 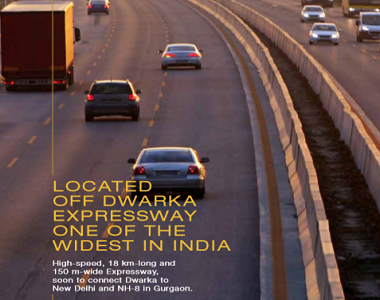 Gurgaon is an incredible city and a part of the National Capital Region (NCR) that has come a long way over the years. Today, the demand for property in Gurgaon has escalated to a great extent. Godrej Meridien is a new residential project in Gurgaon by Godrej Properties Limited that offers bigger and bolder features for a modern-day living of pure perfection! Extended over 14 acres of land, this iconic development contains vibrant towers that offer 2BHK, 3BHK and 4BHK air-conditioned apartments that are classy and stylish. The apartment areas start at 75 sq. m. and go up to a whopping 153.95 sq. mtr., providing maximum space for a brand new level of comfort. This state-of-the-art residential dwelling is crafted for the ultimate living experience every day! With Oberoi being its hospitality partner, experience a world of peace and serenity that will truly satisfy your senses. The apartments are spacious, provide good air flow, natural lighting and contain branded fittings& fixtures, Crema Marfil flooring in living and dining room, beautiful laminated wooden flooring in bedrooms, walk-in wardrobe in master bedrooms, attached servant room with separate entrance, modular kitchens with piped gas, chimney & hob, decorative doors, large balconies with glass railings and double-glazed windows providing jaw-dropping landscape views, intercom facility, safety features and the list goes on. Welcome to a world of super luxury that will make you feel spectacular! This residential development also offers an exclusive range of external amenities for you to relax, unwind and have a fabulous time with your family and friends. If you think you have experienced the luxury of the highest magnitude, think again! The external amenities at this development include a gymnasium by Talwarkars, lavish clubhouse of 3 acres, junior club for kids, 78 seater miniplex, gazebos & forest greens, extravagant banquet facilities, business centre, Olympic size swimming pool with a separate pool for kids, multiple sports facilities, dedicated cricket pitch, squash and tennis court, fine dining restaurants, spa by a renowned brand, air-conditioned plaza and forest themed entrance, landscape garden and 5-layer security for the highest level of security. Indulge in the high-life each day when residing at this plush development. Located at Sector 106 in Gurgaon, Godrej Meridien Sector 106 has a number of your daily and emergency landmarks in close proximity and offers you a lifestyle that is convenient and hassle-free. From reputed schools and colleges, to hospitals, medical centres, banks, ATMs, malls, cinemas, cafes, clubs, pubs, restaurants, resto-bars, entertainment zones, shopping centres, supermarkets, retail outlets, automobile showrooms, convenience stores and a lot more, you can find and accessed them all without the need of long-distance journeys. Godrej Properties Limited focuses on affordable housing and this residential development is a fine example. Starting at a price of Rs.1.6 Cr., the Godrej Meridien price is truly high on luxury and low on cost. You can now own a suave residential space without worrying about a load on your wallet! For added convenience, this development also offers a number of payment plans along with home loans at low-interest rates, NRI services and more for a purchase that will be loved for generations to come! Your luxury apartment awaits you, what are you waiting for?